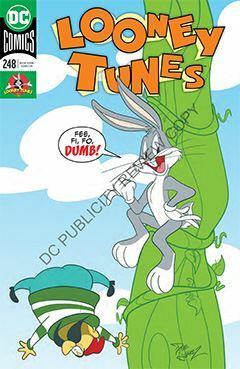 It’s not often Bugs Bunny – the flagship character of the Looney Tunes – gets a starring role in the lead story. But that’s the nature of a good leading man: allowing the supporting characters to do their jobs. Bugs finds himself at the market, running afoul of Black Jacque Shellacque. One beanstalk later, they find themselves in the castle of a lonely and dim-witted giant, who no doubt would love a pet bunny rabbit – to hold and pet and name George. I love the obscure, and the Looney Tunes have a broader range of characters than most people realize. I enjoy seeing them given screen time. The latest issue begins with appearances by Miss Prissy, Wicked Wanda and others.